These buildings are Ypsilanti too. Maia is a 23 year old lover of places [and the things that inhabit places]. She has a deep passion for creating healthy, sustainable, equitable communities. She graduated from Eastern Michigan University in December 2012 with a Bachelor's in Urban and Regional Planning with a concentration in Non-Profit Organization Management. She is currently living in Portland, Oregon where she is working for Multnomah County as an Assistant Planner. Noah Pylvainen is a senior at EMU graduating this spring with a bachelor’s degree in Urban and Regional Planning and a minor in music. His passion for public space and urban design has resulted in several research projects. One titled "A Place to Skate: The Battle for Inclusive Public Space and Why We Need it" which was presented at the Undergrad Symposium and the Michigan Association of Planning Student Conference. 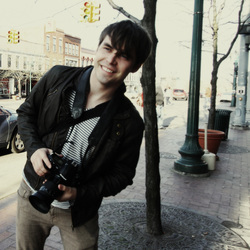 His presentation "The Lost Art of Public Space" was presented at the TEDxEMU this spring. Noah currently lives in Ypsilanti and runs his own wedding and portrait photography business.